Marcelo Carrusca’s penalty sealed Adelaide United’s come-from-behind win. John Van’t Schip made one change from last week’s 5-2 defeat in the Melbourne derby, with Iain Ramsay dropped for Jonaton Germano, who returned from injury in an unfamiliar left-back role. David Villa, in his final game for City before returning to New York, played on the left flank. Josep Gombau made two changes from last Sunday’s win over Perth Glory, with Bruce Djite and Awer Mabil starting ahead of Pablo Sanchez and Fabio Ferriera. It was the ‘normal’ Adelaide 4-3-3, with Isaias permanently in a holding midfield role, rather than the 3-4-3 Gombau has used in the opening three rounds. In what is becoming a recurring theme this season, City started off very strong, getting the ball forward quickly and at a high tempo. Villa was particularly involved in the opening period, getting on the ball and driving forward into dangerous positions – Adelaide looked very uncomfortable, and went behind when Patrick Kisnorbo headed home from a corner. It’s the third goal Adelaide have conceded from a set-piece this season. At corners, they defend with three zonally (Goodwin on the near post, Isaias on the edge of the six yard box and Carrusca on the top of the box) and five marking man-for-man. Here, the allocation was: Boogard on Paartalu, Jeggo on Vill, Elrich on Wielaert and Malik on Kisnorbo – it was the latter who failed to track his man, which is the obvious fault in a man-marking system. Another problem was that Djite arrived late in the box just prior to the corner, but seemed uncertain of his specific role. However, that’s not to say that zonal marking is superior, especially when you watch Germano’s run – he sprints unmarked from the top of the box, and would have connected with the header had Kisnorbo not reached it first. There’s no right or wrong system when marking at set-pieces, and errors don’t come from the system themselves, but in the execution of them – it’s in this regard Adelaide are struggling. After this goal, the game settled down into a less frantic pattern, and the man-marking from either side in midfield became obvious. This too has been a recurring feature of the A-League season, and could be linked to the number of sides employing a similar tactic at the World Cup – the success of the Dutch, for example, seems to have encouraged A-League coaches to follow suit. You can learn more about this in our Breakdown column for FourFourTwo – follow us on Twitter to read on Tuesday. Another possible explanation is the desire of coaches to try and nullify an opponent’s ability to dominate possession, by matching up man-for-man in the midfield zone and preventing anyone from getting time or space on the ball in the centre. Often, we’re seeing sides deliberately try to stop Isaias, a supremely clever player who plays at the base of Adelaide’s midfield and connects the defence to attack with intelligent forward distribution. 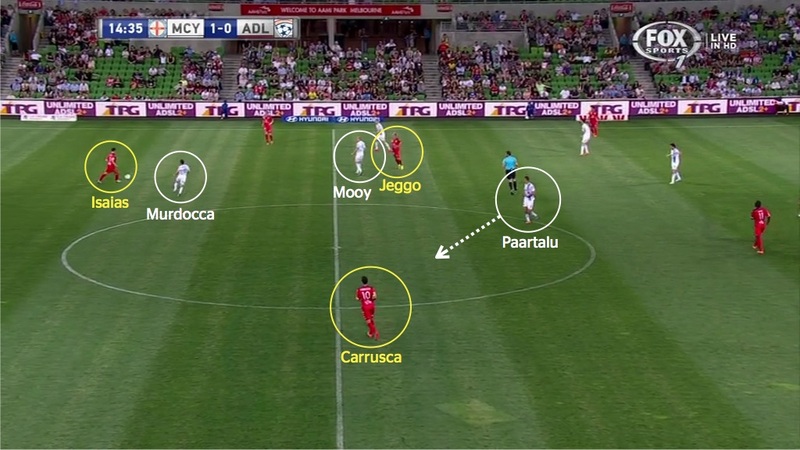 Here, it was Massimo Murdocca attempting to stick tight, with the tight marking reciprocated by his fellow midfielders, Aaron Mooy and Erik Paartalu, sticking tight to James Jeggo and Marcelo Carrusca respectively. This meant sometimes City’s midfield trio appeared very lopsided. 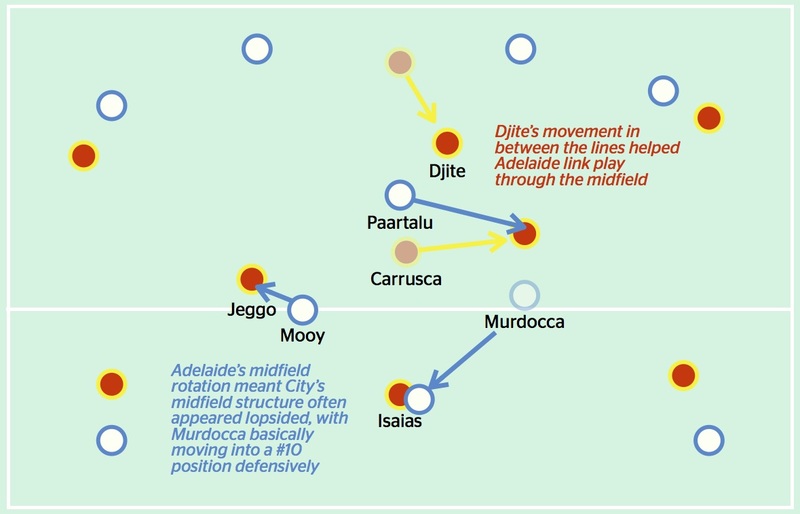 Isaias would drop into deep, central positions, meaning Murdocca, theoretically playing to the left of a 1-2 midfield triangle, had to move high up the pitch and ‘infield’ to stick tight to Isaias. Paartalu, on Carrusca, often had to follow the Argentine whenever the #10 drifted wide, as he naturally does. Meanwhile, Mooy’s job on Jeggo was simple, because they were both working the same channel. Adelaide responded with their own man-marking in midfield when they were without the ball, meaning like in last week’s Melbourne Derby, many attacks flowed down the flanks, with minimal space in the midfield zone. This was more obvious from an Adelaide point of view, especially once they got a foothold on the possession battle around the twenty minute mark and dominated the play. City have become significantly more possession-based this season but a pivotal reason why Adelaide were able to establish their superiority in this particular facet of the game was because of their ability to play out from the back. Both sides sat very high up at opposition goal-kicks to prevent them building up play in deep positions, but where Andrew Redmayne often went long (finishing with 48% passing accuracy), Eugene Galekovic remained committed to keeping his passing short, and helped Adelaide work it past the first line of City defence. Another key factor to Adelaide’s control was Bruce Djite’s lateral movement into deep positions, becoming an extra player in a crowded midfield zone and linking play nicely. He belies the stereotype associated with his size – traditionally, he’d be a ‘big target-man’ – with very intelligent movement in the final third, and he often got on the ball by dropping into little pockets of space either side of Paartalu, which either lead to a City centre-back being pulled out of the backline, or Djite himself getting time on the ball, both of which were advantageous situations for Adelaide. 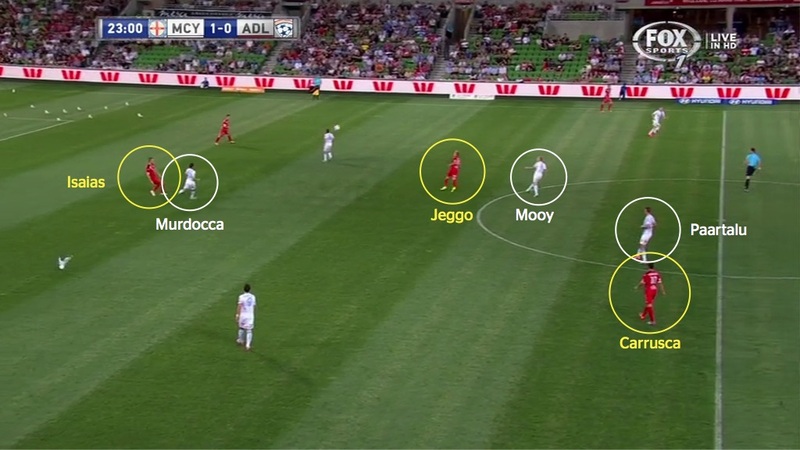 Adelaide’s dominance of possession proved crucial to the game’s crucial feature – their constant switches of play, looking to attack down either flank with long diagonals towards the wingers, who stayed very wide and stretched the pitch. This was probably to target City’s weak links at full-back, where neither Jason Hoffman and Jonaton Germano (eventually replaced by Ben Garuccio when the latter went down injured) looked comfortable. Indeed, Iain Ramsay didn’t feature here because of how much Kosta Barbarouses overpowered him in 1v1 situations in last week’s Melbourne Derby. Another example of Adelaide’s focus on attacking down the wings was the amount of times Awer Mabil got in behind Germano during the first twenty minutes. On three separate occasions, the youngster had space in positions high up the pitch to cut a cross back across the penalty area – none of the three found a teammate, but it summed up Adelaide’s tactics. These examples, along with clips of Adelaide’s switches in the 30-45 minute period, as well as the goal, can be seen in the video below. Isaias was the main facilitator of these switches, hitting nice cross-field balls to either side and generally keeping the pace of Adelaide’s attacks very high, which helped drag the City defensive block out of position. Furthermore, the momentum of the match seemed to encourage Adelaide’s full-backs higher up the pitch, and Tarek Elrich gradually got into the game more. Given David Villa’s lack of tracking, a topic covered in great depth by Australia Scout in the past, it wasn’t surprising he got forward to whip in a fantastic cross for Djite’s headed equaliser. After City again came flying out of the blocks at the half (which might suggest their fading during matches could be psychological, eventually, the pace of the game slowed significantly during the second period. The pressing wasn’t as frantic, and the attacks weren’t as direct. Instead, it was slower, calmer periods of possession play. The game became less about attacking down the flanks, and from an Adelaide point of view, more about balls in behind. Djite was hauled down by Kisnorbo where the centre-back received a yellow card, then Carrusca was caught offside in the sixty-seventh minute having darted onto a Jeggo through-ball, and then crucially, substitute Bruce Kamau was fouled inside the box by Redmayne’s challenge, and Carrusca converted the penalty. Adelaide didn’t dominate as much as in that 20-45 minute period in the first half, but had still been comfortably the better of the two sides and were able to effectively mix their possession with penetration. Indeed, that’s been the major stylistic change comparing this season to last. 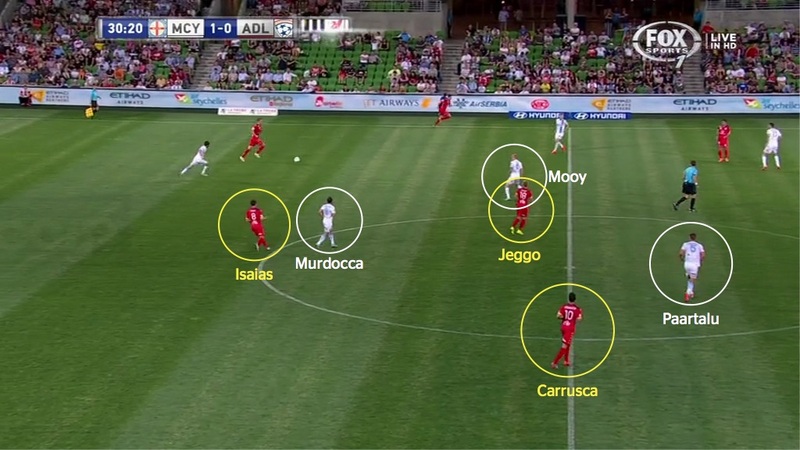 Much of the discussion about Adelaide has centred on their fascinating 3-4-3 formation, but they’ve also subtly changed the way they attack – a reduced focus on retaining the ball, and more emphasis on quick, direct attacking ball. The first pass out of defence is now preferably forward, with Osama Malik in particular pushing forward in possession from centre-back to try and create chances: he hit two excellent through-balls in the first half into Mabil. Gombau’s substitutes were also of some interest. It was novel to see Djite being removed with ten minutes to go and Dylan McGowan coming on in his place, as it meant Carrusca became the most advanced player. He sat somewhere between being a false 9 and his usual #10 role, with McGowan providing some extra height at the back. This felt particularly important when Van’t Schip desperately rolled the dice at the end, switching to a back three of Rob Wielaert, Hoffman and Garuccio, and throwing Kisnorbo upfront as a target for long balls. It summed up City’s frustration, and was ineffective. In the end, a fairly straightforward win for Adelaide. They recovered from going behind by establishing their usual possession game, and circumvented the tight midfield battle, where both sides matched up 3v3 and man-marked each direct opponent, by attacking purposefully down the flanks. 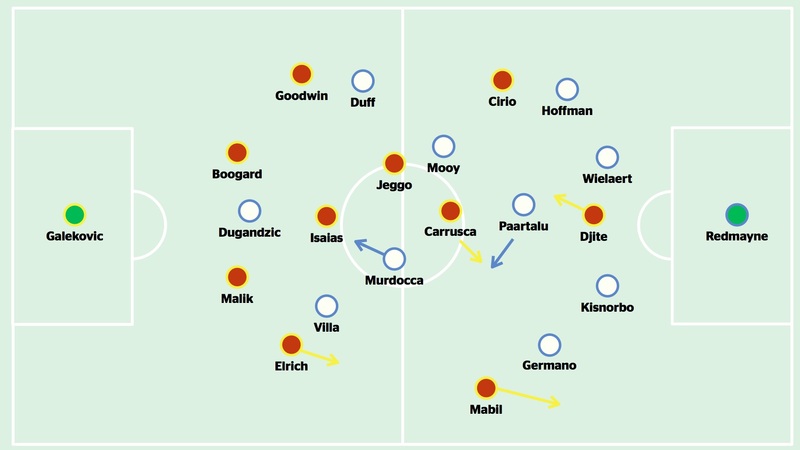 The diagonals to both Cirio and Mabil were effective in isolating Hoffman and Germano/Garuccio, and unsurprisingly, the equaliser stemmed from a wide position. The second half was more even, but Adelaide still felt like the superior side, and they’ve become very good at finding that balance between that desired ball retention, and still attacking in numbers. Combined with improved defensive structure, they’re simply a much more rounded and complete side than a City team in transition, and that showed here. Melbourne are a good team with a few flaws: they can\’t defend, they can\’t score, and are still afflicted with the Heart fondness for mediocrity. Recruitment has been lopsided as usual with a plethora of midfielders and an almost complete disregard for defence. Hoffman and Ramsay are the obvious weaknesses and will be the focal point of every opponent\’s game plan. Reedman has regular poor decision making and lapses of concentration and positioning. Dugandzic is a shadow of his former self, Germano is made of glass and occupies a visa spot whilst hardly ever playing a game.. JVS is Melbourne\’s version of Man City\’s Mark Hughes, hopefully someone on the organisation takes football seriously and notes the recurring template, early sterile possession, fadeouts in the middle of the game punctuated by defensive errors, vulnerability on both flanks, inability to score. \’s be a run of 3 or 4 wins and then the inevitable slide back into mediocrity. The fans are sick of it. I take it you are a Melbourne City fan, then, Bela?! Thanks for being a regular commenter. But, yes, it\’s frustrating, even as a neutral. I think JvS does get a bit of a \’free pass\’ at times – I know certainly appreciate him more than other coaches primarily because he mixes up his tactics, which keeps things interesting from the point of view from which this site is written. City are becoming very predictable, aren\’t they? Strong starts at the beginning of each half, good midfield play but nothing effective in the final third, and the full-backs being targeted by opponents…and unfortunately, the latter issue is of personnel, not system. Hoffman and Ramsay fit the system \’in theory\’ but in practice they\’ve both been quite poor, and it\’s tough to see how City can improve unless they improve in that department.